Here is an interesting point from Jyoti on the Bhutan cover from my post “A lovely cover from mystical Bhutan” on 25th March 2009. Below is an extract from her Rainbow Stamp News' Bulletin, April Issue. Thank you for sharing Jyoti! Do you know? A Breakthrough in Postal History....... Here is an interesting cover sent from Bhutan to Singapore which bears logo of India Post on the barcode label attached to it. It may surprise anyone as to why India Post logo appears on a letter posted from Bhutan to Singapore. 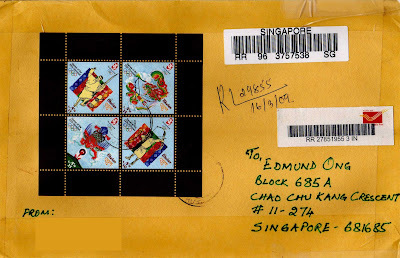 Here is the interesting finding which I got through joint effort of noted philatelists Mr. Shrikant Parikh, Ahmedabad, Mr. Prashant Pandya, Vadodara and the source of this letter, my blogger friend Mr. Edmund Ong of Singapore. You will be surprised to know that India Post and Bhutanese Govt. has mutual arrangement for forwarding of foreign mails' originated from Bhutan.....the mails go to New Delhi from Bhutan, and then to destinations with Indian personnel's help with Indian labels for records. Here is a detailed research by Mr. Prashant Pandya which reveals following facts about this letter and makes an interesting subject for the collectors of Postal History. The Cover is Registered Cover sent from Thimpu with registration no. RL 29855 and has been registered on 16th March 2009. There is a treaty between India and Bhutan regarding exchange of mails in which one point is “The Postal Administration of India will forward to such of the member countries of the Universal Postal Unions are indicated by the Postal Administration of Bhutan, articles of correspondence of Bhutanese origin under the provisions of Articles 44 of U.P.U. Constitution (Vienna, 1964). No transit charge will be levied by the Indian Posts and Telegraphs Administration for forwarding such mails to those foreign countries either by surface or by air.”On the basis of Postal arrangement between the Government of India and the Royal Government of Bhutan relating to the letter post dated 21 April 1967,Bhutan Post may have sent the article for further forwarding to Singapore. (Probably Bhutan is not having direct flight to Singapore. They do have one stop flights for Bangkok) and thus the Registered Letter must have arrived at Delhi from Thimpu and from Delhi again the article was booked with registration no. RR278519553IN. (Prefix of label RR is for registration from India Post). One can notice the registration label of Singapore on the cover which has number RR963757538SG. This article was tracked on Singapore Post website and was found that the article was booked on 20.3.2009 and it was delivered to customer on 24.03.2009.Thorough findings reveal that the origin of article is New Delhi. That means the cover arrived at New Delhi from Thimpu on either 19th or 20th March and booked from New Delhi on 20th March. The cover reached at Singapore on 23rd March and delivered to addressee on 24th March. It is the observation and presumption about the Indian Registration label. It is fact that the article has been routed through New Delhi and registration label has been affixed in India and not in Bhutan. Check out her Monthly e-Stamp Bulletin, Rainbow Stamp News. Really interesting to know this.